Outdoor Tech®, the maker of the iconic Turtle Shell speakers and an assortment of rugged audio and power products, launches a breakout camo edition to expand their offering of rugged audio and power products. Mossy Oak’s classic camo pattern brings a unique element to Outdoor Tech’s products specifically created for use in various outdoor activities. A discrete design allows Outdoor Tech’s rugged technology to be enjoyed anytime, anywhere. The collaboration with Mossy Oak enhances the aestheticesthetic functionality and appeal of Outdoor Tech’s high quality rugged products. 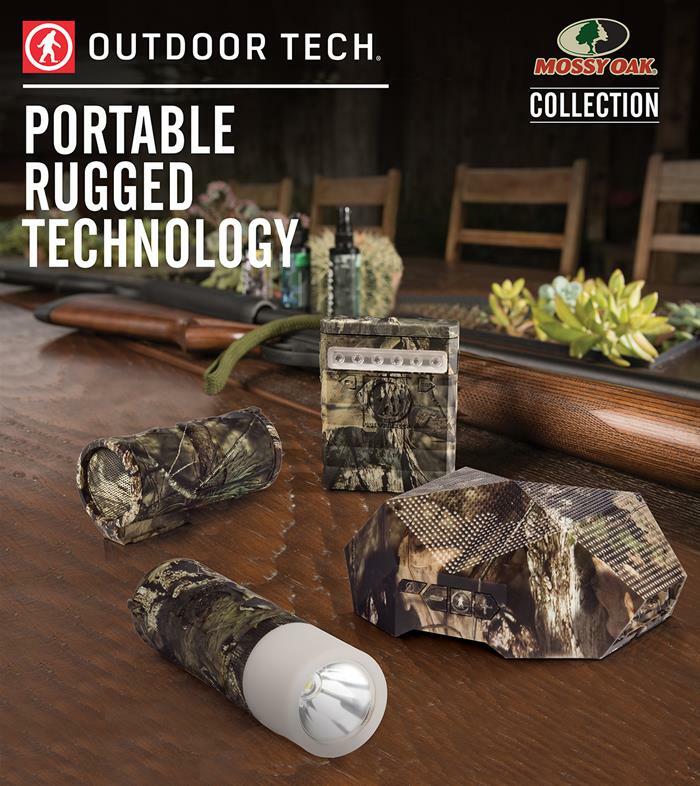 The collaboration between Outdoor Tech® and Mossy Oak provides a larger audience with a new breakout camo edition of Outdoor Tech’s most popular products. The power-packed Buckshot Pro, rugged Turtle Shell, and portable Kodiak Power Line are a few of the products that will be available in camo print. The products are not only ideal for the outdoor, camping and hook and bullet retail channels, but also the lifestyle channel with its premium Mossy Oak graphics and trendy camo appearance. In addition to launching Mossy camo in Outdoor Tech’s most popular existing products, Outdoor Tech® is also unveiling a brand-new Kodiak Power Station 100 & 200. This innovative product incorporates a standard 110V U.S. outlet, 12V car outlet and two USB ports designed to bring long-lasted rugged power to the great outdoors. Outdoor Tech® will also offer a rugged Solar Panel to be used in conjunction with the Kodiak Power Stations, or to recharge any other mobile device. These new products will make their anticipated debut at the Outdoor Retailer tradeshow in Salt Lake City, Utah. Production is in full force, so the highly anticipated products will be ready to hit the retail shelves just before the busy holiday season in Q4. “I’m very excited to partner with a premium brand who has the same passion and obsession for the outdoors as we do. Mossy Oak is the leader in camouflage prints and this new collection of products fits any outdoor lifestyle.” – Charlie Gugliuzza, CEO at Outdoor Tech. If you didn’t make it to Outdoor Retailer, check out the Outdoor Tech + Mossy Oak catalog here.